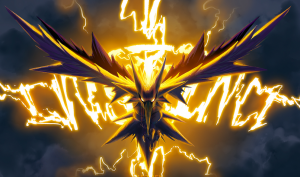 Zapdos is a legendary bird Pokémon that has the ability to control electricity and is available at some point in Pokemon Go!!! It usually lives in thunderclouds. The Pokémon gains power if it is stricken by lightning bolts. Zapdos is the Pokemon that team Instinct is based off of in their logo.